I can't believe it's already part way into September which means the close of another capsule Overall I was super happy with this capsule. I think I'm finally nailing down my warm weather style which makes me super happy! So to quickly recap this past season I'll be sharing all of the items that made up my summer capsule, items that were added, my favorite outfits from this summer & what I learned about this capsule. Lets dive in! 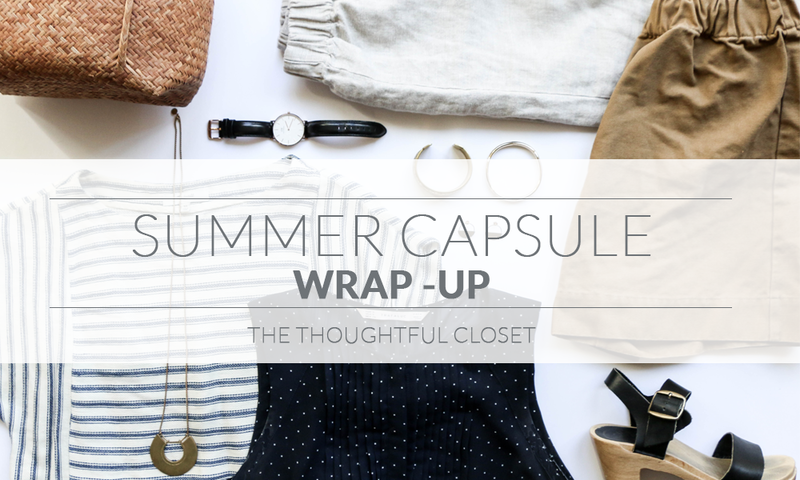 I did some major tweaking in this capsule (as you'll see by the new/newish items below). I swapped out several pieces including my brown sandals, denim long coat (weather never got cool enough at night for that one), my flower romper which I'm still trying to figure out how to style but I still love it, and a couple pairs of skinny jeans. I just had too many jeans. These tweaks are things that I try to take note of so I can better plan for the future. I add a few lovelies this season that I've had on my mind for a while. Some were purchased second hand with a sprinkle of new new items. I loved my navy pumps from my spring capsule so much that I wanted to find a similar pair (and ideally sustainable pair) for the summer. So far these have been a great addition and will probably be sticking around for fall! Shorts have always been a tricky thing for me. That's why I was insanely excited to find out the ES would be launching a line of shorts in her Warm Weather Collection. I ended up snagging this pair and will definitely be purchasing more in different colors! I'm thinking the clyde version in black next then the florence in natural. I was so happy to finally make the jump (pun intended) and invest in my first jumpsuit. This has become a go-to outfit all by itself! Unbelievably comfortable and fun to play around with and layer. I had this top on my wishlist for a while. I finally decided to pull the trigger when ES released a lightweight version in her Warm Weather Collection. I absolutely love it for summer and I'm going to try to transition it into fall. I'm thinking a cotton version will be more appropriate for cooler months but we'll see! Another item that's been on my list for some time. Except that I bounced around between the T top, the staple basic and the blank canvas. I also bounced around with color like crazy. I'm happy I settled on umber for this version since it was my favorite color this fall and I'm looking forward to styling it this fall! Oh hey more wish list items! 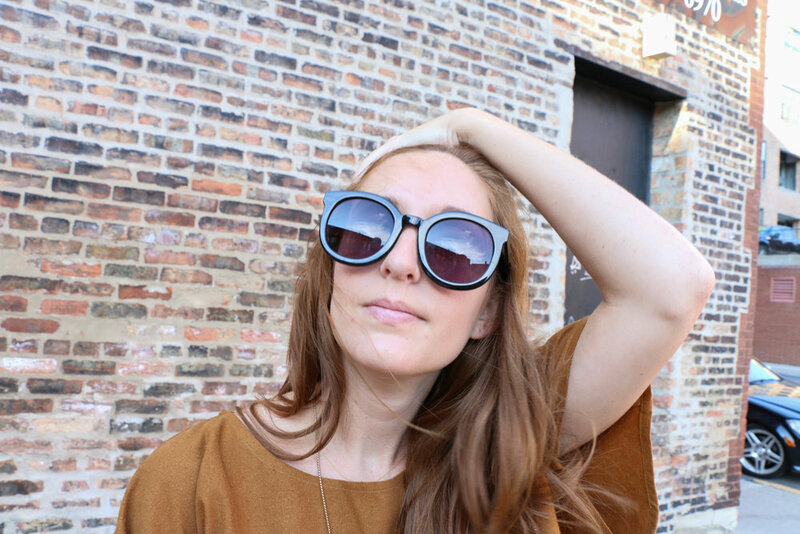 ES pieces take up the majority of my summer wardrobe because she does warm weather so well! I found these secondhand and had to pull the trigger. 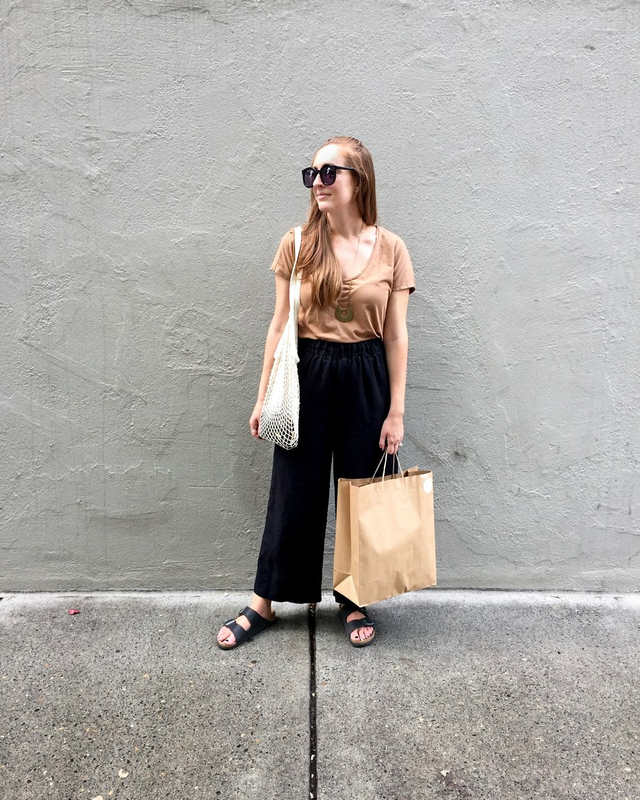 I wear my linen florence pants so much that I knew a skinny leg in linen would be worn just as much! This one is not one of my proud moments and I wanted to make sure I shared it with you. I used to buy pieces for specific events, especially vacations. I would get super excited for my vacay and decide that I needed some new looks to wear on my trip. This dress is a relapse of that. I got it for my beach vacation with my mom because I felt like my closet wouldn't transition well for the beach. I thought I'd look like a misplaced city person. So I caved and got the dress. I do love it but wish I'd thought about it during different circumstances and not during a vacation high. This year I felt very comfortable in my summer capsule. I found a new silhouette that I want to continue to play with (oversized top + wide leg bottom), freshened up my jewelry collection and started my statement earring obsession! 1 | I'm still hashing out my summer palette. One of my goals for this year is to figure out a color scheme for each season. I want these colors to be ones that I'll crave each year. For example, for two years in a row now I've loved blush for spring. Fingers crossed this continues for a third but by determining a color scheme I can better understand what pieces I may want to add to my closet in the future. Last summer I was really feeling jewel tones and tried to remove black from my wardrobe for the season. It was a very bold move for me. Black is one of my staples and this year I was not feeling that palette at all. Black was very prominent and I also loved a range of blues and cognac (which I've been obsessing over for months now and this isn't stopping any time soon!). I felt much more comfortable with my color choices this year so I think my capsule colors will be similar to this year for 2018. 2 | Work on my shorts. Still a challenging clothing category for me. It's hard for me to find shorts that I love. This year I was able to find a short that I really love and that's the Florence shorts in cotton canvas by Elizabeth Suzann (I know, shocking that I absolutely love another one of her pieces). But in all honestly these shorts were a life savor for me. The length is perfect and the material is super durable. I opted for the no pocket version but might look into the Clyde Work shorts in black for next year. I'm most likely going to end up with a pair of shorts in every color because I love them so much and wore them ALL THE TIME. She also has a linen version that I'm also intrigued by but for now I'm sticking to cotton canvas. 3 | Summer style isn't as hard as I thought it was. I've always had a very hard time dressing for summer. It sounds so silly because really all you need to do is throw on a dress and shoes and you're done. I always like to add some texture or an interesting element to my outfits so sometimes I feel like a dress and cute shoes isn't enough. I have a strong tendency to overthink things and I believe that's where my summer style barrier stems from. When it's hot you just don't want to wear a ton of clothes! This year though I loved my outfits. I just went back to basics in my mind by focusing on colors & pieces I already loved. If I was over wearing jean shorts and a tee everyday then I would force myself to reach for a cotton short and crop top. 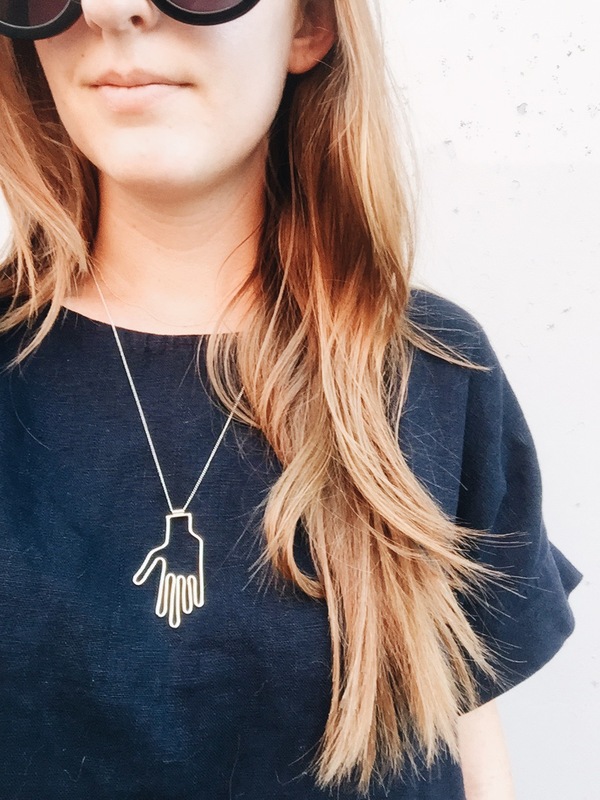 If you're getting tired of an item in your closet or an outfit try changing it up with a piece you already have to help you create something new. What also made this summer super simple was being smart about the material of my clothes. I've already found certain silhouettes that I love, aka wide leg + crop top. I didn't want to loose my favorite outfit combination just because it was getting warm. My solve for this was focusing on wide leg pants that were made of linen instead of a heavy denim or cotton. By leaning on lighter materials I was able to keep and create new silhouettes that I love. 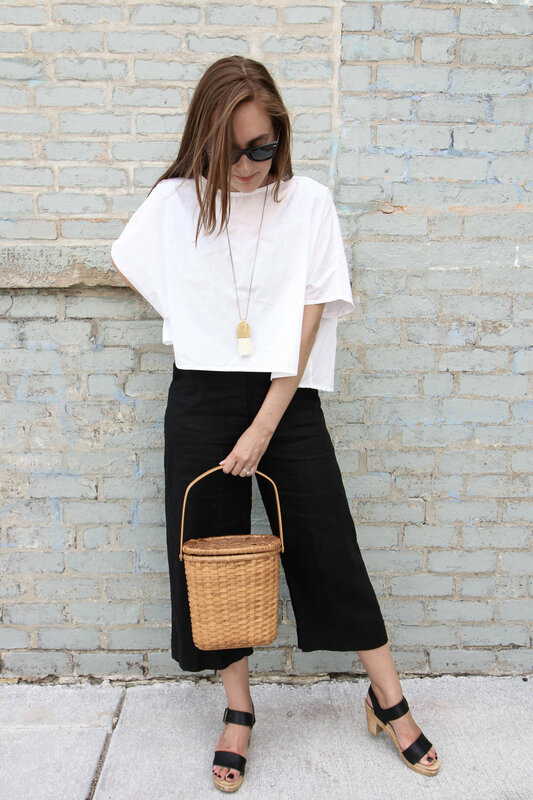 Like the wide leg crop + oversized crop top in outfit number 3 above! There you have it! Another capsule in the books :) Soon I'll be sharing my picks for fall and for the next couple days I'll be doing my autumn dance to bring on some cooler temps!